After the success of the 7 New Wonders of the World campaign in 2007, the organizers have now launched a similar internet search for the Seven Wonders of Nature and Venezuela's Angel Falls could be one of them - if enough people vote for it. Back in 2007 more than 100 million people from all over the world cast votes for hundreds of architechural gems. The final seven Wonders of the World were Machu Picchu in Peru, the Pyramid of Chichen Itza in Mexico, Christ the Redeemer in Rio, Brazil, the Colosseum, in Rome, Italy, the Great Wall of China, the ancient city of Petra in Jordan, and the Taj Mahal in India. This time it's all about natural treasures and, apart from Angel Falls, Venezuela has seven other candidates, including the Los Roques Archipelago, Auyantepui Mountain, Mount Roraima, Pico Bolivar, Sarisarinama Mountain, the Guacharo Cave, the Gran Sabana and Canaima National Park. The voting system is simple, you just have to visit this page and introduce your email and a few details that they promise will not be used for any purposes apart from the voting. Basically, every vote counts, so please get in there and give the Venezuelan candidates some votes. 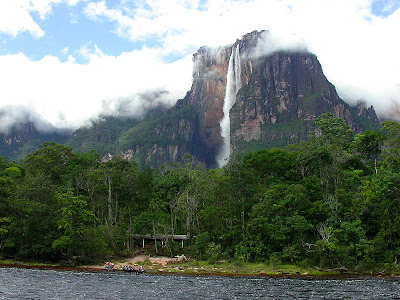 Angel Falls, the highest waterfall in the world, has a good chance of making it into the final 21 if we all mobilize our friends and families to make their votes count. On 29 September, Angel Falls was 29th on the the live ranking list of the 77 top candidates, with Asia dominating all the spots in the top 10. That's a pretty cool result, considering that Mount Everest is at number 12. And there's a long way still to go. Voting for the nominees will continue through to 31 December 2008, when the candidates will be whittled down to one per country, with only the top candidate from each country being allowed to proceed. Then on 7 July, 2009 the New7Wonders of Nature panel led by Professor Federico Mayor, former Director-General of UNESCO, will review the top 77 nominees and choose 28 finalists, to be announced on 21 July 2009. Those 28 finalists will then be put to the popular vote. But before that it's important that the Venezuelan entries get official support. Angel Falls has support from a sponsoring body in Venezuela but it has not been officially recognized yet. Meanwhile, Iguazu Falls has the full backing of Brazil and Argentina. Rather ominously, a note on the new7Wonders website for Angel Falls says that unless the issue of sponsorship is resolved Angel Falls "will be eliminated from the finalist section". But don't despair. Get voting. And lets get all the Venezuelan entries high on that top 77 list, where they deserve to be. Yo tuve mi luna de miel en Canaima. Es una experiencia inolvidable, es algo que si no lo presencias nunca te lo podrias inmaginar.